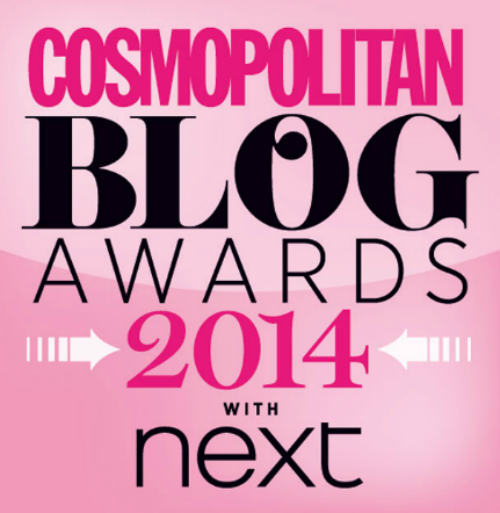 I've been shortlisted in the Cosmo Blog Awards!!! I'm not sure if the title of this post has given you an idea of what today's post is about, but just in case it didn't... YES Just Julie, my little blog has been shortlisted in the Best New Beauty Blog at the Cosmo Blog Awards.... to say I'm ecstatic would be an understatement!! Firstly I'd just like to say a MASSIVE thank you to anyone who nominated Just Julie! It still shocks me that anyone reads my blog, let alone felt the desire to nominate it for an award. How the hell has this happened? I started my blog just over 6 months ago, after having failed a few times prior to this. Something just kind of clicked this time though. I had become more involved in reading blogs and I knew it was something I wanted to do. Now I love to talk, I can chat for days, but would I be any good at writing? I'm not the most literate person, my grammar isn't that good, I tend to write how I talk but THANK GOD for spell check, it has been my saving grace! ha! I'm still not convinced I'm any good at writing BUT I love to write about what I love, and that's beauty. It's in my heart. Hair, beauty and fashion have been my career for the best part of 12 years, so I feel like I can write about what I know, what I have experience in and what I know people like to read about. Although I'm still not convinced that I'm any good and have lot's to improve on, but I kind of like that way. I strive to grow as a person and I plan on growing Just Julie in the exact same way, and that's a journey I'm really looking forward to embarking on, and one I hope you all join me on to. I never thought in my wildest dreams that I would be shortlisted. Monday was just CRAZY! My twitter was going MAD! The amount of support I have received from the lovely blogging community has touched me. I didn't realise that so many people actually enjoy my blog. I shouldn't doubt myself I guess, but it's in my nature to do so, so this whole thing just makes it even more special to me! I'm not deluded enough to believe I stand a chance in winning, but to be in that shortlist, up against some AMAZING blogs, is enough for me. It means I have actually achieved something, something I never thought I could do. I guess I just want to say a huge thank you for anyone who nominated me, anyone who has taken the time to stop by and leave a comment, send me a tweet, re-tweet me.... so thank you, yes YOU.... you right there reading this! If you enjoy my blog and believe I deserve to win this award then I would love you FOREVER if you voted for me. Of course you don't need to vote if you don't want to, but I'd still love it if you would stop on by every once in a while. You can vote for Just Julie as the Best New Beauty Blog just HERE Just a heads up, you need to continue pressing NEXT until you reach the end, you'll see where you can put your name and email address in, only then is your vote submitted. I say that because I have seen a number of tweets with people asking where is the submit button.